See the items below for the latest news from Street Level Photoworks. To commemorate #GreenArts Day 2019 we asked photographer Jeremy Sutton-Hibbert to discuss @EverydayClimateChange, a collective Instagram account involving 20 photographers from 6 continents. Doro Zinn who undertook a residency at Street Level last August as part of Photographic Parallels, will participate in the exhibition A place called Дom at SomoS Art Space, Berlin alongside artists Stephanie Steinkopf and Tatiana Hahn, curated by Anastasia Leonova. The latest Street Level Members exhibition is Paul Walton's 'Given'; a series of darkroom prints of figurative sculpture, shot on film. The subjects are ‘art treasures’ in galleries, manikins, cheap souvenirs, sometimes sculptures of people, sometimes gods or animals, and images of stained glass are included as ‘sculpture’. 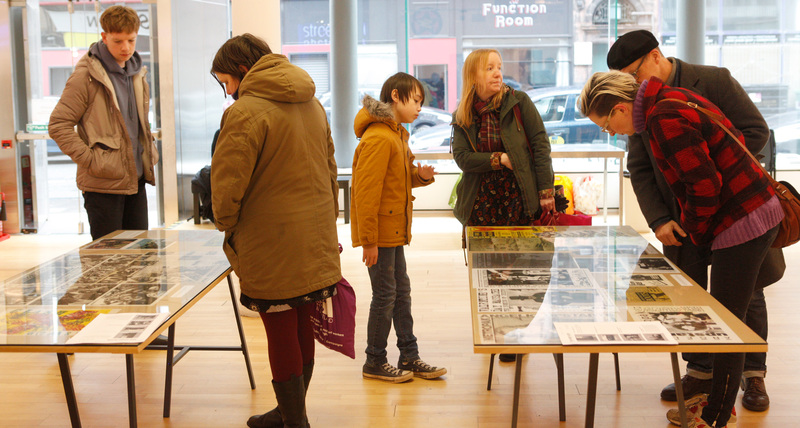 Street Level Photoworks continue their partnership with Regional Screen Scotland to explore a new way of presenting photography to new audiences. This new instalment sees the presentation of a video work which compliments the major exhibition of three photographers work opening at Street Level in June 2017, Scotland's Far North. The information carried by the many pages on display at this book launch charts the journey taken by 2nd year students from the Fine Art Photography Department at Glasgow School of Art. Street Level curate Scottish work for projection at Just Another Photography Festival, which will take place in Varanasi, India, between the 3rd and 6th of November. We are now into the second week of the Season of Photography 2016! The Season of Photography brings together and illuminates the wealth of photography exhibitions and events taking place throughout Scotland from 1st September - 30th November 2016.